A proposal to increase peak time fares on west coast ferry routes has been put forward to try and manage demand. It comes after ferry operator Caledonian MacBrayne (CalMac) faced capacity issues, especially during the summer. Transport Secretary Michael Matheson said the proposal was among a number of options being looked at. He told MSPs another option was to encourage passengers to use ferries at off-peak times. CalMac, a publically-owned company, operates the Clyde and Hebrides ferries network. 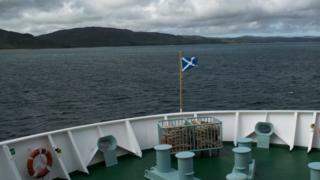 It has faced calls, including from Outer Hebrides Tourism, for better management of demand on its ferries during peak times. Mr Matheson told Holyrood's rural economy and connectivity committee "a number of different options" on how to ease peak-time difficulties were being examined. He said: "It could be the option of higher fares at peak times, or it could be the option of incentives at off-peak times where there is capacity on the ferry. Mr Matheson added: "One of the things that is particularly important here is that it is not something that is necessary on every route. "It maybe needed on some specific routes at specific times when there is a need for some demand management arrangement to be put in place." Uisdean Robertson, who is the chairman of Western Isles local authority Comhairle Nan Eilean Siar's transport committee, said more ferries and not higher prices was the solution. Road equivalent tariff (RET) applies to CalMac's network. It allows fares to be realigned with the equivalent cost of travelling the distance of the ferry routes by road. Mr Robertson said: "RET has made quite a difference to people coming to the Western Isles and we are heavily dependent now on tourism. "I think it is important that we stick to the principle of RET and that prices stay at the level they are at at the moment." He added: "Increasing prices on certain days of the week or certain times of the year is not going to solve the underlying problem, which is a lack of capacity."